Back in college, I had the pleasure of experiencing my very first speakeasy on a visit to see my BFF in New York City. After asking a friend’s friend for the secret telephone number and managing to score reservations that very evening (it was a Tuesday night). we arrived on the stoop of a tailor shop. Undeterred, we knocked on the door and entered a relic of the 1920s Prohibition era. Sadly this location of Milk & Honey has recently moved from its inconspicuous home in the heart of Chinatown on the Lower East Side to a more trendy location in the Flatiron District. But still, the covert exterior, the dimly lit booths, the expert mixologists who craft complex and stunning drinks… nothing less than the best in this Sasha Petraske owned haunt. It was here that I discovered one of my favorite cocktails — the gin smash. 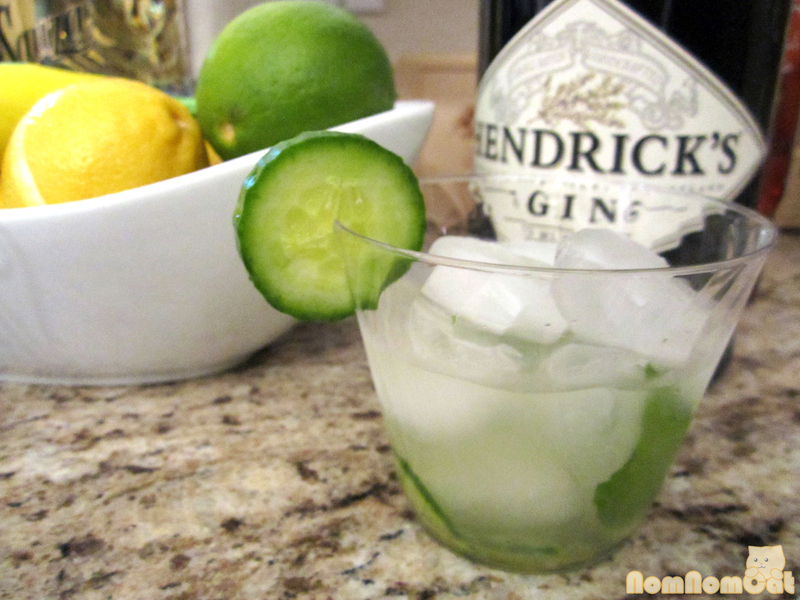 Sometimes I still dream of that beautifully composed blend of cucumber, mint, and ice cold gin. When we host gatherings at our place, I make sure to have a bottle of Hendricks gin and plenty of muddling ingredients on hand. It’s always a good time for a gin smash. Muddle together the cucumber, mint, and simple syrup. Squeeze in the juice of one wedge of lime, add the gin, and shake with ice in a shaker. Strain and pour into an Old Fashioned glass over ice. Top off with soda water and garnish with a sprig of mint. This particular recipe may not change your world quite like the Milk & Honey version changed mine, but it is a wonderfully refreshing and clean-tasting cocktail. I love the fragrance of Hendricks, described on their website as small-batch gin hand crafted in Scotland, with an infusion of cucumber and rose petals. It’s the perfect cooling drink to enjoy on a hot summer evening or to reminisce about brighter summer days during the dead of winter. Cheers! There are not enough alcoholic drinks on food blogs these days :) Looks tasty! Love the cucumber.